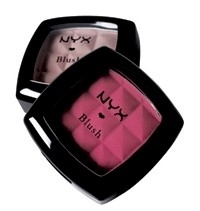 Our pressed powder blush delivers sheer, silky colour that glides on, blends beautifully and creates a natural glow. The formula is richly-pigmented and lasts for hours. Available in 25 shades. Mica, Talc, Magnesium Stearate, Dimethicone,Isononyl Isononanoate, Nylon-12, Zea Mays (Corn) Starch, Zinc Oxide,Silica, Tocopheryl Acetate, Phenoxyethanol, Ethylhexylglycerin. May Contain: Titanium Dioxide (CI77891), D&C Red 6 (CI15850), D&CRed 7 (CI15850), D&C Red 27 (CI45410), D&C Red 30 (CI73360),FD&C Yellow 5 (CI19140), FD&C Yellow 6 (CI15985), Iron OxideYellow (CI77492), Iron Oxide Red (CI77491), Iron Oxide Black (CI77499),Manganese Violet (CI77742), Ultramarines (CI77288). Works as good as my MAC blushes and costs a lot less. It gives a sheer coverage but is easily buildable if you prefer more colour on the cheeks.It lasts for a good 5 hours on the cheeks and goes on smoothly without feeling powdery. The packaging could use some work, my cover came off after a week but I cannot complain as it is so affordable. Great blusher with a range of shades for all skin tones.